Working on the completing the quarter final fights week 9 of The Ultimate Fighter will consist of two quarter final fights and has promised a surprise about one of the coaches that will shock everyone. Not sure there will be much shock as we have long known Chuck and Tito will not be fighting. McCray who took the wildcard win will be fighting Kyle Noke, a long time friend. In addition, Seth Baczynski will take on Brad Tavares. At the opening of the episode, Tito’s news is exposed as he announces to some of his team that he could be under the knife once again for another neck surgery. Everyone knows of Tito’s troubles with injuries to his spine both at the back and within his neck. Having had numerous surgeries to date, he questions whether or not he should go under once again. In the meantime, Kris McCray and Kyle Noke have to prepare to fight and for the first time for each of them they are matched up against a long time friend. We will see if either feels the pressure or if they can step up and get the job done. Kris McCray is a strong fighter by much less experienced when it comes to fighting at this level. Kyle Noke has shown his skill and has a significant advantage. Kris is noticeably less confident, or at least it seems, as they stand across from each other on opposite ends of the octagon. 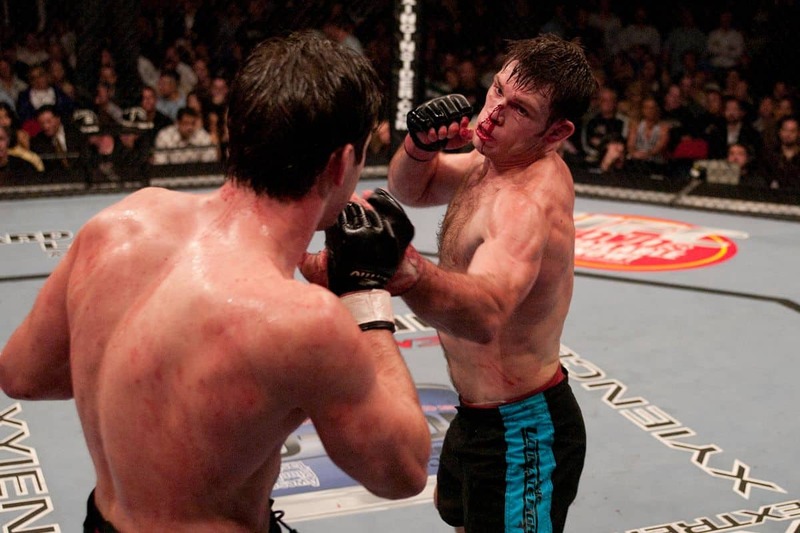 However, as they come out, Kris engages with a jab and a kick and even after taking a knee scores a takedown. They are soon back on the feet, but McCray manages a second takedown of the more experienced Noke. At the halfway point you can tell the fighters have forgotten about their past relationship and they just want to win. Kyle Noke gets a good grip of Kris McCray’s neck and continues to squeeze, on the ground, as they get back to the feet and back to the ground again. McCray does manage to escape eventually and take top position. Kyle does a great job at managing from the bottom and landing more punches and elbows than Kris can do from the top. They exchange punches at the beginning of round two and for the third time Kris McCray gets a takedown and then a fourth. He isn’t causing any damage once he gets Noke down, but doesn’t seem to have any trouble getting him there. Not a match you want sitting in the judges hands if you are Kyle Noke. Kris manages control past the halfway point of the round, but then Kyle Noke slides around, gets Kris’ back and begins to work. An exhausted McCray allows Kyle Noke to get an arm around the neck that is eventually let loose for some reason. Without any real effort Kris McCray is back on top to finish the round. Dana announces the fight is over but shortly after steps into the octagon and announces it is not yet over. Like we mentioned, in the hands of the judges at this point and with that we have to think this is Kris McCray’s fight to win. In solid fashion Kris gets another easy takedown at the beginning of the round and much of the same. Kyle Noke is breathing heavy from the mouth while on his back and the seconds are flying by. Half way through the round, McCray is still in control on top of Noke. The student amongst many experienced fighters is showing he has the heart to be The Ultimate Fighter. Kyle Noke tries a submission but ultimately is unsuccessful and the referee stands them back up. It makes no difference as Kris McCray grabs hold of Kyle Noke and with ten seconds remaining has Kris has Kyle against the cage. With the control Kris had over Kyle throughout the round, all three judges score in favor of McCray. Winner McCray! Brad Tavares and Seth Baczynski are expected to be a bit different. They like each other, but aren’t long term friends. Bottom line is that they are ready to fight and both want to bang until one of them drops. The frenzy begins and the energy is high, as Seth holds Tavares against the cage and gets him to the ground. Suddenly Seth has Taveres’ back with both hooks in. Brad is defending, but Seth has the hooks deep. The monkey will not get off his back as Seth moves to a body triangle and eventually slips an arm in under the chin of Tavares. Tavares does escape, but Seth remains strong until a point where he lets open an opportunity. Brad springs into action and moves into top position. Seth locks in around Brad’s head, but Brad lifts Seth and slams him twice. With less than thirty seconds to go, Brad Tavares lands numerous punches. At the close of the round as the buzzer sounds, Seth kicks Brad in the face and it appears as though he is out for a split second. The round closes with Brad trying to regain his senses as it was obvious the kick landed perfectly. As we come back from the break the doctor and referee are discussing whether Brad Tavares can continue. After a quick discussion it is decided Brad cannot continue and he is declared the winner by disqualification of Seth Baczynski by illegal kick at the close of round one. There is a bit of controversy at the call as team Ortiz believes the kick was to the chest and not to the face. Tito and Chuck get into a shouting match over the fact that coaches from Team Punishment disrespected a member of Team Liddell. Obviously stemming from frustration that the two may not fight at the close of the season and they truly hate each other. Danas pull Chuck aside and alerts him that Tito has officially pulled from the end of the season fight. Chuck stands up pissed and then the teasers begin. Will Tito be allowed to continue as a coach knowing he is out of the end matchup. The final quarter final fight ends in tragedy and the finals are announced. All of this next week on The Ultimate Fighter and reported here as no one else can.